Observed in mixed conifer forest on the South Rim of the Grand Canyon, Arizona, USA. 11 October 2012. FLOWERS: The composite heads each enclose several yellow disc florets. Three to five series of bracts subtend the florets. Flowering begins after the summer rains and well into autumn. LEAVES: The leaves are linear with varying amount of pubescence between plants and populations of plants. SHRUB: Woody branches rise to 1+ meter in height and lack the thick coating of whitish pubescence found in similar species. 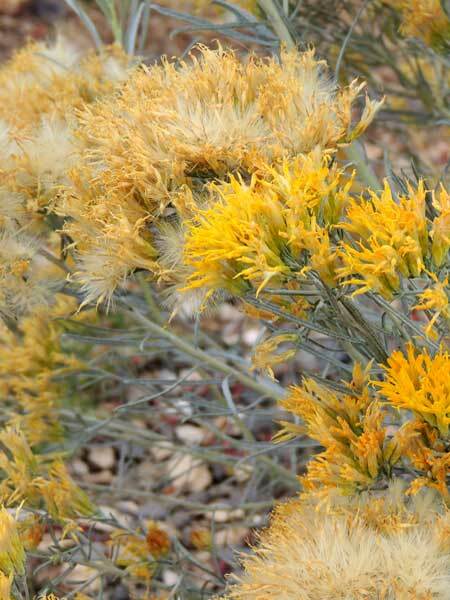 RANGE: Several similar species of rabbitbrush are distributed through northern Arizona in the drier sites of ponderosa woodland as well as even drier habitats such as piñon-juniper, Mojave Desert and the Painted Desert.